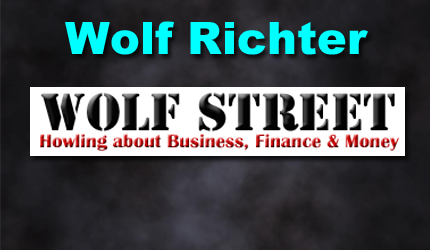 On his site WOLFSTREET.com, Wolf Richter slices into economic, business, and financial issues, Wall Street shenanigans, complex entanglements, debacles, and opportunities that catch his eye in the US, Canada, Europe, Japan, and China. He lives in San Francisco. 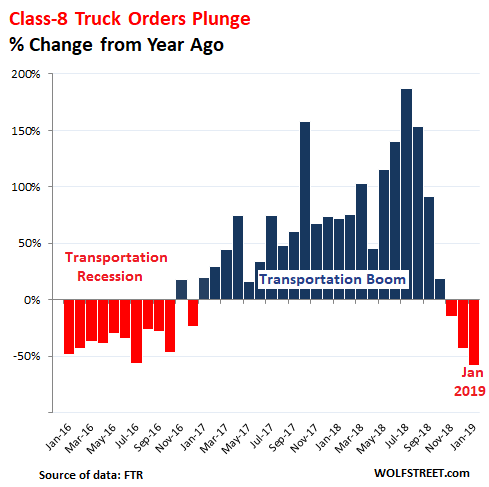 In January, orders for Class-8 trucks — the heavy trucks that haul trailers with goods of all kinds across the US — plunged by 58% from a year ago, to just 15,642 orders. It was the lowest number or orders since October 2016, toward the end of the “transportation recession” when Class-8 truck orders had plunged to the lowest levels since 2009, and truck and engine manufacturers responded with layoffs. 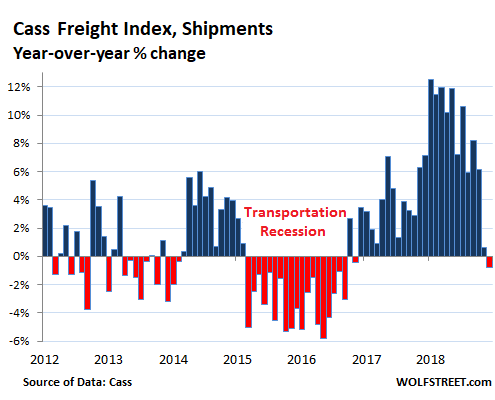 In the chart above, also note the blistering boom in orders in 2017 and 2018, when demand for transportation services soared, and trucking companies that found themselves short on equipment went on an ordering binge, trying to be the first to get their orders into the system. 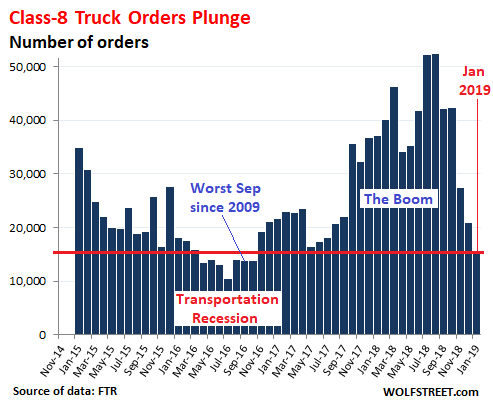 This historic explosion in orders led to a record backlog for truck makers and their suppliers. 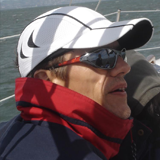 Then, in this viciously cyclical industry, the cycle progressed to the next phase, with demand for transportation services returning to normal-ish levels, even as capacity was rising, and truckers slashed their orders for new equipment. Over the past 12 months through January 2019, truckers ordered about 450,000 Class-8 trucks, while US truck makers have an annual capacity of about 320,000 trucks, which averages out to about 26,500 per month. So the phenomenal spike in orders in early and mid-2018 led to a historic backlog that truck makers are still working through. There have been some cancellations, and the backlog is shrinking, but it still extends well into this year. 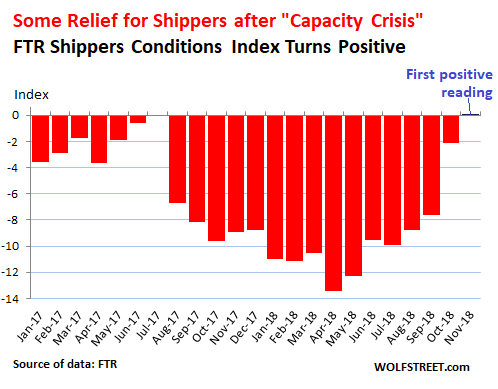 Because there are always two sides to everything: The historic boom for the trucking industry was a nightmare for shippers; and a transportation recession, dogged by excess capacity, always feels like Cloud-9 for shippers.